I can’t even begin to tell you how much rage “that’s for girls, that’s for boys” makes me feel. Pretty angry to be honest, especially when it’s said to my daughter. I remember learning about gender stereotypes when I was 14 and it shook me then with so much anger. I was determined that if I ever had children, and at 14 I was pretty adamant I never would, never tell them something was for girls and something was for boys because it is a massive lie. A teacher got us to look through the Argos catalogue and see who was playing with trains and mechanic sets and who was playing with dolls and kitchens. It’s still done to this day. It is reinforcing that girls are the homemakers, the babymakers, the cooks, cleaners, the mothers and that’s all they are good for. It’s showing that boys will grow up to do and be, and girls will be left behind. Girls and boys can play, do, be whatever they want to be. They have choices. That is just a simple fact that so many people want to battle against. So many people say oh no you can’t play with that. But what really annoys me most is that it’s not really my daughter that’s told she can’t do this, that or the other but other little boys who are told they can’t play with “girls” things. I mean, I have an incredibly pink daughter. She loves dressing up, collecting Shopkins and colouring. She also runs incredibly fast, is super strong and active, is fearless and eats so much food. I am talking all the food here. She isn’t afraid to throw a ball around, she gets filthy and have I said she runs fast? She has so much energy. She can be quite reserved at times and yes I suppose I would describe her as feminine. When I was growing up my sister was not the same as me. I was quite feminine growing up and my sister was not. She was boisterous, she threw things, she liked football and can I just say she’s was really good at it. She was a bit scruffy, she doesn’t really do makeup and the first time I saw her in a dress (where she didn’t negotiate carrying a toy gun and a sheriffs badge) was her prom at sixteen. I have never heard anyone say to her that she shouldn’t play football and she should dress nicer because she’s a girl. I don’t really think the issue is with girls. Now I believe that every parent makes the right decision for bringing up their children. I also believe that children will pick the toys they want to play with. I know a lot of boys that choose cars over dolls and a lot of girls that do the opposite. I know some that do both. Neither option is wrong and children should be free to choose. I know that there are girls that like “girly” things and there are boys that want to hulk smash and play cars all the time. That is completely fine. What I absolutely hate is when my daughter hears that something is for girls, and something is for boys. That boys shouldn’t play with dolls, with makeup, with dressing up things. It doesn’t matter if they’re not interested in it, please don’t say that some things are for girls in front of my daughter. Please don’t say that boys can’t do this, that or the other. It is a horrible thing to say. What you are effectively saying to my daughter when you say boys can’t play with this, is that only girls should. It’s reinforcing gender stereotypes. It’s so much bigger than just girls and boys playing with toys. Saying it over and over and over is going to make my daughter believe that if she ever sees a boy playing with something he shouldn’t she will feel it’s wrong. You are pushing your stereotypes onto my child and that is not how I parent. I never, ever tell her things are just for boys and just for girls because it is not true. I want my daughter to grow up confident in her own mind that she can do what she wants. If she wants to be a homemaker and raise loads of kids then I will love and support her choice, if she wants to have a city career I will help push her to the top and if she wants to do both then I will be there as her cheerleader. If I ever have a son and he wants to play with dolls, dress up as a Disney princess and push prams I will buy him what he wants. If he wants to play video games, play football and run all the time I will support him and if he wants to do both then that is absolutely fine with me. I will never, ever tell him that he can’t have what he want’s because it’s “just for girls.” Just because he wants to do things that others might consider girly or feminine will not “turn him gay”. Do you know what it will do? It will lead him into a happy fulfilled life where he fully knows himself and isn’t at risk of suppressing how he feels. It will ensure that he is respectful to women and other men, that he will accept people for their choices that they make in their lives because he has been allowed to do so on his own. The point is that there are some amazing men out in the world that are makeup artists, chefs, cooks and of course amazing fathers. There are women that are fantastic politicians, bankers, city careers and mothers at the same time. They became who they are because they were allowed to discover what they loved, hopefully free from stereotypes. You can let your child play with whatever you want. But please don’t tell my daughter that this is for girls, and that is for boys. Exactly!!!! This is exactly right and yes it all comes down to choice! I have always subconsciously gone for blue, brown and blacks for boys and pink, purple and white for girls. I guess its so prominent in our culture now its hard not to get sucked in by it. What i have never done is said ‘that’s for boys, or that’s for girls’ and i have always taken lead from my kids. My son now happily wears dresses and more ‘feminine’ (i say this loosely) clothing. We recently went shopping for a skirt as he really wanted one. I love how he feels comfortable doing this with me, but also sad as he will only wear the items in the safety of our home. I guess he already understands how society view those who fly against the norm. I am all for building him up though, and helping him to be individual in whichever way he feels that is. I think it’s so important to be lead by your kids choices isn’t it?! After all it’s really about them and what they love! I know what you mean it’s ingrained so strongly in our society to always go for what we believe is typically girly or for boys but yes when people say that it really grates on me! Amen Sista! I’m a huge believer in toys are toys and clothes are clothes and who plays with or wears what shouldn’t matter. I’m loving John Lewis’s move to remove the gender split in their clothes range! Yes I’ve seen that too I really like that range and love the fact that these conversations are opening up so many more options for children to really choose what they want because of what they like not what society feels is appropriate for them! I absolutely hate it when kids are being boxed into categories. So what if girls play with cars and trucks and boys play with dolls – it is all about choice and I believe a child should be allowed to explore all options and find what he/she loves. #DreamTeam. I know it’s so silly isn’t it. It makes me cringe so much and yes I think girls are much more accepted for these type of things. Its just a shame the same fairness and acceptance isn’t extended to boys. I bet that was so lovely just to see so much colour for all! I love this! When I first started buying baby clothes, I was shocked that everything was either pink or blue. My toddler loves her dinosaurs – AND her dollies. Choice is key I think! I hear you sister. And please, no more “mummy’s princesss” t-shirts when the boys’ version says “i’m an awesome genius”. Lets arm our girls for the future. Lovely post. I agree whole-heartedly. Let kids just be kids and enjoy doing whatever makes them happy… why should we always judge? I agree choice is what really matters and being lead by them and their decisions! 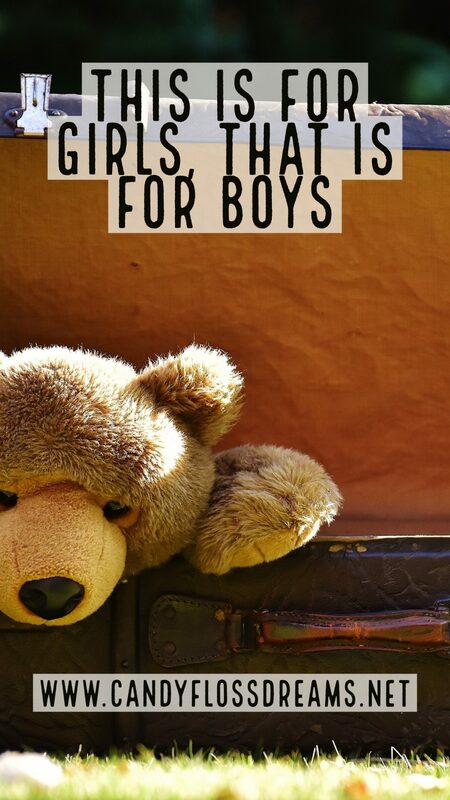 It is silly and just such a waste of breathe saying this is for girls, that’s for boys! I completely agree choice and freedom for all without prejudice and judgement! I know it’s so frustrating!! I think it’s other children saying it which is really tough because it’s what they’re parents and relatives are saying to them! The more it’s nipped away wth our kids hopefully they will do the same with theirs and the archaic attitude will phase out! Thank you. It is very narrow minded! My daughter and I both love Lego and the creative possibilities it holds. It’s frustrating when toy companies market this way! It is sad and it’s very frustrating that they learn it at school although I imagine it’s from other children than teachers in most cases! Thank you! Yes I’ve had similar disagreements and conversations with family too and it’s so frustrating! Incredibly outdated you’re so right there! Yes I completely agree. It really feels like we seem to take one step forward and two steps back with this kind of thing and it really frustrates me. It really does make “girls things” look like the weaker toy and that’s not right or fair. Hopefully the more we encourage our children about choice, freedom of choice in others and to act without stereotype, judgement and prejudice the better we will all be. Perfect post. Let them play with what they like. Help them to grow and develop, do not limit them with gender stereotypes.